There is no doubt that going through a break-up can be a nasty experience, but what a lot of people are not aware of is that a lot of times the pain you feel from getting dumped isn’t even because of love. The heartache and sadness people go through post break-up, more often than not, is actually because of a combination of reasons that aren’t even associated with love at all. This is important when trying to get over someone. When you can understand what’s really behind your feelings, you will have better control over them and this can help significantly speed up the healing process …ultimately working towards falling out of love with the person. 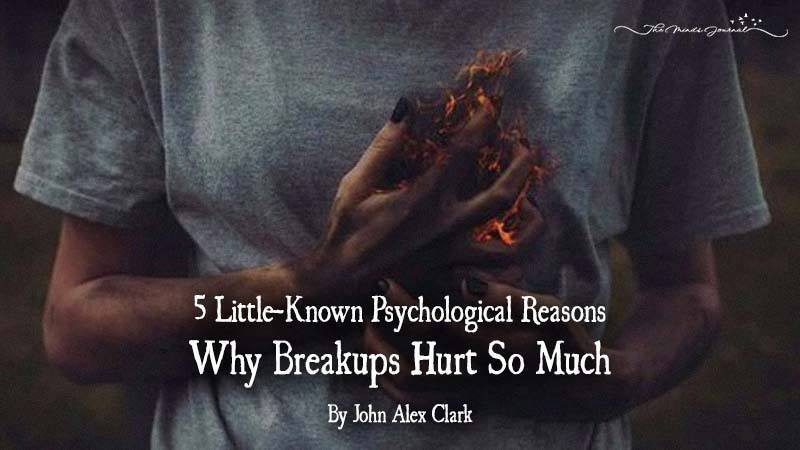 To better understand this, in this article I’m going to outline 5 hidden reasons why a breakup can cause so much pain. And what’s amazing about these, is that they have nothing to do with “love” or your ex being “The One” or anything like that. Whether your relationship was picture perfect or a living nightmare, the feeling of loss is usually generalized in the human experience as painful and depressing. It doesn’t matter if he was Mister or Miss Right; you had already set your mind on tying the knot and living happily ever after. Isn’t that where all relationships go? Breaking-up with someone means starting over, and some people just can’t handle that. “There’s no one else for me!” and “What if nobody else puts up with me?” are a few common questions people ask themselves in this situation. Looking at things from this perspective, it’s easy to see that this particular, stressful idea isn’t tied to your ex at all. It isn’t about the love you shared – it’s about your own personal welfare. As soon as you find that new, special someone, all fears of being “forever alone” will be thrown out the window. A lot of people, without noticing it, use relationships to cover potholes in their lives. Whatever the problem might be, whether they stem from a poor relationship with a parent or family member, underachievement or plain dissatisfaction with work, or a non-existent friendship circle, it’s always easily kept neat and tidy with a (seemingly) happy little relationship to front the fortress that is your life. Unless of course you break-up, then there’s nowhere left for you to run from all your unresolved issues. Again, this particular break-up-induced stressor isn’t tied to your ex at all. Resolve personal issues before engaging in a new relationship, that way you’ll always have something (or someone) to hold on to when things get rough. Breaking-up and more specifically getting dumped can cause major damage to a person’s ego. Who wouldn’t get hurt knowing someone “didn’t want” them anymore? It’s upsetting and self-worth can usually go down with it, but understanding that this has nothing to do with your ex can help ease the pain. Learn that your worth isn’t defined by the people around you. If they don’t want to be in your life, then hey, good riddance! It has nothing to do with you as a person, and getting dumped shouldn’t lessen how you see yourself. People breakup with other people all the time for reasons that have nothing to do with the dumpee …but with private reasons that have to do with they themselves. Once you realize that, you take control of your feelings and move on faster from the bad juju. The pain of betrayal, that’s how I felt. There was not one dream, There was not one plan he wasn’t in. I built my world around him and crushed me when one day he said goodbye. Through all the pain there is one thing I learned though: love yourself. Be courageous to lose what needs to be lost. A reflection of the struggle to accept or reject their own self image created by their upbringing and environment growing up…. Or EGO struggles that the current trauma feeds. It’s simple! It’s the pain of being rejected. For example my cousin lost his wife in an accident. Yes that’s a very difficult situation. But My wife chose to leave. Being rejected is tough but its especially hard when it’s the person you trusted more than anything, the one you allowed to hold you heart, all the while feeling like a man of steel you quickly find out your heart is made of glass when she dropped it letting it shatter to pieces. I digress but being rejected is another human being saying you are no longer good enough for them.